My kid is crazy about Minecraft, a virtual-world game where everything is drawn as simple cubes, including pumpkins. I've seen"square" (actually cubic) watermelons in the news, so I thought I might try the same thing and grow a real Minecraft Pumpkin this year. As it turns out, someone actually makes and sells an 8"watermelon cuber, but it's $110. Plus shipping. I'm crazy, but not that crazy. So I'm thinking I should build my own cuber. Does anyone see any reasons why a pumpkin would be harder to force into a cube than a watermelon? Are they "stronger?" I can buy cut-to-size sheets for a fraction the cost of the finished cuber linked above, and I'm thinking the hardware should be only a few bucks more. I need to use something clear, otherwise the pumpkin won't turn orange. Should I use acrylic/Plexiglass or polycarbonate/Lexan? What thickness should I use? Does that ready-to-use cuber look like 1/4" thick? Apparently you can remove the mold and it will continue to grow and mature. Build one out of hog panels. It may not only be square but segmented. A imprint of "The Last Supper" and sell them on Ebay. I would use the polycarbonate because IMO the glass would just be to weak. I would also go at least 1/4 in. That is what the cuber looks like and I think anything smaller could be to weak if the pumpkin wants to get big. I would also make the box bigger than an 8 inch square. I think it would be much neater if it was like 1 foot by 1 foot. You would have to change that though based on the variety of pumpkin because a jack be little will not fill even an 8 inch square. I've read in a few places that polycarbonate ages poorly in sunlight unless uv coated, and that it also has poorer scratch resistance. But that it's way stronger. From that site I can get six pieces of 12" x 12" of either material in either 1/4" or 3/8" at a decent price. Do you know if there's any material difference between extruded and cast acrylic? Have you worked with both materials? I have no advice, but I can't WAIT to see you get started and their progress. TheWaterbug wrote: I've read in a few places that polycarbonate ages poorly in sunlight unless uv coated, and that it also has poorer scratch resistance. But that it's way stronger. I have worked with acrylic and glass not the poly. I did not know about the poly aging poorly. Do you have a place that can uv coat it for you? This topic is absolutely awesome. Square watermelons would be soooo much fun. And...so much easier to eat. n8young wrote: This topic is absolutely awesome. Square watermelons would be soooo much fun. And...so much easier to eat. I agree, very fun. But I don't understand. Square melons or pumpkins are obviously easier to stack and ship, maybe even to slice, since they don't roll around. Why would a square watermelon slice be any easier to eat than a round one? You have to cut it in half to get to the middle anyway. 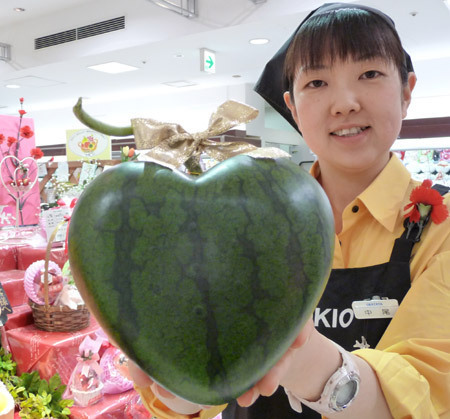 apparently for some reason the japanese are big in to this stuff and the weird shaped watermelons sell for $100's. 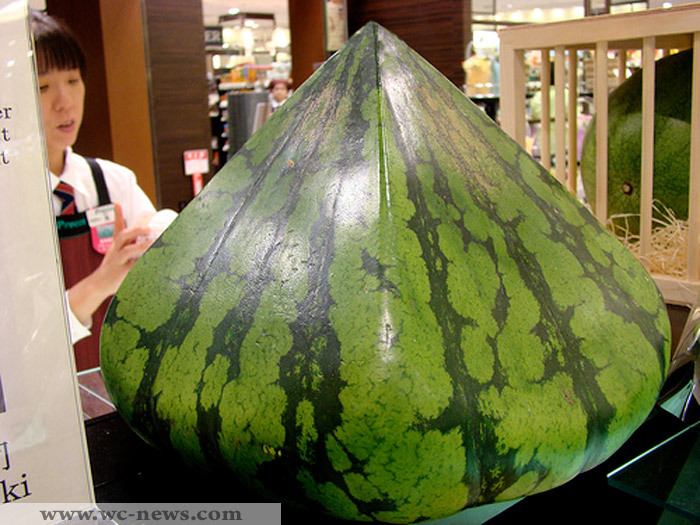 http://www.tofugu.com/2008/08/15/japane ... rd-shapes/ If you could figure out a mold material that is flexible enough and strong enough to do this you could make a lot of money, selling the melons. Could a pottery maker make an appropriate size and shape mold out of clay and fire it? Will the melon still ripen if it is inside a dark box? There's moldable plastic resins that come in clear. That same site has abrasion-resistant, UV-coated polycarbonate, but the 1/4" UV-coated poly is quite a bit more than the 3/8" cast acrylic. And then there's the cutting problem. I don't have access to a bandsaw or table saw. But I do have a brake at work. What's the thickest acrylic that you've successfully scored and snapped? What about snapping poly? I don't really care too much about the quality of the finished edge as long as I get a square box, but I don't want to save money on material and then waste half it through my own incompetence/inexperience. As it is I will probably buy at least one spare piece to learn on. Regarding the size, that's a tough question, too. I thought about using the 12" pieces as-is, and making a one cubic foot box, but then I tried converting that to an approximate weight. One cubic foot of water weighs 62 lbs. Guesstimates on the density of a pumpkin range from ~50% - 75% that of water, so a 1 cu ft pumpkin could weigh in the neighborhood of 31 - 47 lbs, which is a pretty big pumpkin. On the other hand the 8" x 8" x 8" box is only 0.30 cu ft, which would be a ~9 - 14 lb. pumpkin, which seems a bit small. Then again I guesstimated the volume of a medium-sized water melon in my kitchen and was surprised to see that it was only 0.30 cu ft. I guess that's not entirely surprising, since that's the size of that melon cuber, but the melon seems larger than that in real life. I'm growing Howden, Jack-o-Lantern, and Big Max (among others). Big Max should certainly get to this size, and the Howden and JOLs might, if they're doing well. Maybe I should just stick with the 1 ft panels, save myself the effort of cutting, and put a Big Max in there. p.s. that site will cut to any size I want, but sizes smaller than 12" are actually _more_ expensive than the 12" panels, I presume because they already have 12" pieces in stock. Earlier in the summer, I was surfing the net for info on making cast concrete garden decorations -- birdbaths, classic and modern statuary, etc. There are quite a bit of DIY instructables, and plethora of mold suggestions, including the bit about pre-fab concrete mold rental. Some more stuff about ice molds for party table decorations. These might lend themselves to pumpkin molding? One idea that really had me thinking was using glass industrial lighting shades and breaking them after concrete had set to extract the finished product. I'm thinking that pumpkins and melons would exert too much hydrostatic pressure for glass to handle, especially in the perpendicular direction. Glass is strong under compression, but weak in just about every other direction. Materials like acrylic and polycarbonate are much more flexible and will "give" quite a bit before breaking, and even when they do they tend not to shatter. I also want something reusable. I think I need something transparent in order for the pumpkins to ripen properly (I think), so a wooden mold might not work well. I have no idea what the max width is for scoring and breaking. I would think you could easily do the 1/4 inch but the 3/8 might be pushing it. ReptileAddiction wrote: I have no idea what the max width is for scoring and breaking. I would think you could easily do the 1/4 inch but the 3/8 might be pushing it. Heh. The guy who wrote this comprehensive site on fabricating acrylic enclosures responded to my inquiry with "You would have to be superman to snap 3/8" acrylic." Despite the opinions of my kid and my cat, my wife assures me that I am not superhuman. I don't have a bandsaw or table saw, but I do have a circular saw and a blade with fine teeth. I might try sandwiching the material between two pieces of plywood when I cut. I also have to think about the cutout for the stem. Have you ever hand-sawn plexi with a hacksaw? Last edited by DoubleDogFarm on Tue Aug 13, 2013 5:09 pm, edited 1 time in total.